Enjoy succulent fresh oysters, award-winning olive oil and other locally-produced specialty foods, accompanied by wines from some of the Island's top boutique vineyards. Your guide will provide an entertaining and informative commentary along the way. You will visit an award-winning olive oil mill, followed by two vineyards, each offering a range of gourmet tastes to accompany their wines. Treats may include oysters straight from Te Matuku Bay, wild honey, the famous local green herb spread and artisan cheeses. Afterwards, enjoy a platter lunch at one of our top vineyard restaurants. After lunch you will be returned to your accommodation or to the ferry back to Auckland. A light jacket and refillable bottle for water if desired. As part of our environmental responsibility we are trying to cut down the use of plastic bottles on our beautiful Island. Fresh clean drinking water is available from fountains at the wharf and at all of the vineyards/ tasting venues. Also proof of age if under 25 years old. Your ferry to Waiheke will depart from pier 1 or 2 at the downtown ferry terminal, located at 99 Quay St. If you have purchased ferry tickets as part of your booking, we will email you a booking reference number shortly, which you will need to quote at the ticket office on the day. Otherwise, you do not need to book this ferry but make sure you turn up at least 20 minutes prior to departure time. If you have not purchased ferry tickets with this order, you will require a return Waiheke ferry ticket which will cost $40 pp ($45 Between Dec and the 10th FEB) purchased from either the Fullers ticket offices located on the Wharf. The ferry to Waiheke takes 35 minutes. When the ferry arrives at Matiatia (the Waiheke Wharf) our Ananda Tours Driver will meet you with a sign welcoming you. Please note that our office is not located at Matiatia Wharf, so if you choose to catch an earlier ferry on the day, our guide won't arrive at Matiatia until the scheduled time. Please call us if you arrive early on 372-7530 and we will tell you where to wait. Discover for yourself why Waiheke is world-renowned for its wines. Visit three of the Island's fine vineyards with one of our local guides, On the way, stunning scenery is around every corner, and you will be entertained by your guide’s commentary on the history, geography, culture, people and produce of Waiheke. Price includes wine tastings at least 3 boutique vineyards. **After the 1st of July 2019 the cost of lunch (one course and glass of wine) is included in price. 5.5 hours on Island time (excludes ferry time). Lunch and ferry ticket price not included. Please catch the 10am Fullers sailing from Downtown Auckland. Your ferry to Waiheke will depart from pier 1 or 2 at the downtown ferry terminal, located at 99 Quay St. If you have purchased ferry tickets as part of your booking, we will email you a booking reference number shortly, which you will need to quote at the ticket office on the day. Please note that if you book after 4.30 pm the night prior we will send your ticket booking number in the morning after 8 am (when the ferry company opens). Please call us if you have not recieved them by 9am. The ferry to Waiheke takes 35 minutes. When the ferry arrives at Matiatia (the Waiheke Wharf) our Ananda Tours Driver will meet you with a sign welcoming you. Lunch is usually around 1.30 pm, so please ensure you have an adequate breakfast. If you have a specific vineyard you would like to go to for lunch we will try and accommodate your choice subject to availability on the day. 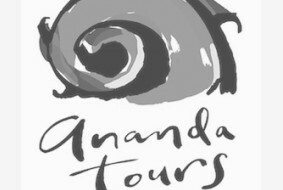 Please email us on info@ananda.co.nz, otherwise we will book you into a vineyard of our choice. You will be accompanied by one of our experienced guides, who are all intimately familiar with Waiheke’s history, culture, people and produce (and great wine enthusiasts themselves). If you would like to linger a little longer on the island then we can arrange a dinner booking at a venue of your choice or drop off into Oneroa Village and enjoy the evening at your leisure. Commentary and scenic tour of the Island, all tasting fees and a platter style lunch (cold meats, seafood, dips etc). Otherwise, you do not need to book this ferry but make sure you turn up at least 20 minutes prior to departure time. If you have not purchased ferry tickets with this order, you will require a return Waiheke ferry ticket which will cost $38 pp purchased from either the Fullers ticket offices located on the Wharf. Indulge your passion for fine wine in this exclusive tour to three of Waiheke's top wine producers. Taste a selection of premium wines and learn about them from the winemaker, owner or a senior staff member. Weather permitting, you may also tour the vineyard. You will be accompanied by one of our experienced guides, all of whom have completed a Bob Campbell Wine Diploma course, and are themselves great wine enthusiasts. Choose from Cable Bay, Mudbrick, Obsidian, Stonyridge, Kennedy Point, Te Motu, Passage Rock, Tantalus and Jurassic Ridge, and finish with a superb lunch at any one of the delightful vineyard restaurants. If you are interested in purchasing their wine, we can also arrange a visit to some other vineyards that are not usually open to the public, such as Destiny Bay and Woodside Hill. Lunch can be booked at a vineyard of your choice (own expense). A light jacket and refillable bottle for water if desired. As part of our environmental policy we are trying to cut down the use of plastic bottles on our beautiful Island. Fresh clean drinking water is available from fountains at the wharf and at all of the vineyards/ tasting venues. Also proof of age if under 25 years old. Otherwise, you do not need to book this ferry but make sure you turn up at least 20 minutes prior to departure time. If you have not purchased ferry tickets with this order, you will require a return Waiheke ferry ticket which will cost $40 pp ($45 between Dec - 10th FEB) purchased from either the Fullers ticket offices located on the Wharf.